We’re just a day away from the 2015 FIBA Asia Men’s Championship, and the time is ripe to preview each of the sixteen teams who will vie for the lone outright Asian slot in the 2016 Rio Olympics. Teams are divided into four groups and will play each other team in a single round-robin format in the first round. The top three teams in each group move on to round two, where they join another group’s top three for another single round-robin set of games. The top four in each second round group qualify for the single-elimination quarterfinals. The winners move on to the semis and then the final two teams standing battle each other for the slot in #Rio2016. Let’s discuss the group of death, Group D, where we have four perennial powerhouses: Taiwan, Lebanon, Qatar, and Kazakhstan. - Taiwan’s only pro hoops circuit, the Super Basketball League, ended its season on April 7. Returning national team coach Chou Jun-San replaced incumbent head coach Hsu Chin-Tse, who begged off due to health reasons, in May and didn’t waste much time before calling up his wards for training. Taiwan had a three-game trip to Korea, where they played Korea’s national pool twice and one KBL club team. Taiwan participated/hosted the 2015 William Jones Cup, finishing in third place behind Iran and the Philippines. They also flew to Manila last week for the 2015 MVP Cup, losing all three games, even one to a PBA club team. Most everyone looks healthy, save for speedy swingman Jet Chang, who’s sidelined by an injury he sustained in the Jones Cup. Lin Chih-Chieh was named part of the FIBA Asia All-Star Five in 2013, when he averaged 10.7 points, 4.9 assists, and 3.8 rebounds per game. Even at the relatively advanced age of 33, Lin remains a vital cog in Chinese Taipei’s hopes, and he will surely carry much of the burden of leading this team once again. Lin is listed as a guard-forward, but what he really is is this team’s primary playmaker. Perhaps on 90% of the time, the possession will go through Lin, and it won’t be any different in Changsha, Hunan. Lin can expect a lot of support, especially from naturalised center Quincy Davis, who plugs this team’s traditional weakness at the middle. Fellow veterans Tseng Wen-Ting and Tien Lei should provide huge lifts for the squad, too, while up-and-coming player Liu Cheng is projected to be a ball of energy. Guys like Lu Cheng-Ju and Hung Chih-Shan will spread the floor, which should help offset this team’s size disadvantage when ranged against the tourney’s bigger squads. - Division 1 of the Kazakhstan pro league ended in April, coach Vitaliy Strebkov didn’t waste much time calling up his wards for the national pool, pulling in the members of 2014 Asian Games squad sprinkled with other top players from the Kazakh league. They had a two-game tune-up series with the Xinjiang Tigers of the Chinese Basketball Association (CBA), winning both games. A few weeks ago, they also flew to Lithuania for more training and tune-up games. Having a healthy Jerry Johnson back in the team was also a major positive step in preparation for the 2015 FIBA Asia Championship. Anatoliy Kolesnikov will be playing in the FIBA Asia Championship for the first time, but he won’t be a stranger to many teams as he already turned a lot of heads in the 2014 Asian Games. He registered 13.9 points and 8.1 rebounds per outing in that competition, helping Kazakhstan finish among the top four despite having to go through the qualifying phase. Kolesnikov is a versatile forward who can hurt opposing teams in many ways, and he is expected to have a breakthrough performance this year. With 6 guys standing 200cm or taller, coach Strebkov has the size to be able to match up well with big teams like China or Iran. This is also complemented by a skilled corps of guards and wingmen, led by Johnson, streak shooter Pavel Ilin, and veteran playmaker Rustam Yargaliev. Perhaps what will endanger Kazakhstan’s chances is inconsistency, which they displayed two years ago in Manila. - Lebanon certainly wants to reestablish its place among the top teams in Asia. Things, however, haven’t gone according to plan. They had a brief trip to Europe for some tune-up games, but other than that, there hasn’t been much exposure for the team. The Lebanese were also supposed to go to Manila for the MVP Cup, but they backed out at the eleventh hour purportedly to join another pocket tournament in China. Even that venture, though, didn’t materialise. By far the biggest blow to their cause, however, has been the news that living legend Fadi El Khatib won’t be able to suit up for the team. With El Khatib out of the picture, the time is ripe for a new generation of stars to step in and step up. Lebanon reportedly signed Loren Woods up to be their naturalized player for Changsha, but his age and health have eventually forced the team to replace him with Jasmon “Jay” Youngblood, who has played in Lebanon’s pro league and actually played for the Cedars in the 2015 West Asia qualifying tournament. Youngblood is a solid wingman who can play three positions and is a threat from practically anywhere on the floor. At his best, he can carry this team on his shoulders against even the toughest contenders in Asia. In an ideal world, Lebanon should be bannered by, among others, El Khatib and half-Australian center Julian Khazzouh. Things, however, have been far from ideal for the beleaguered Cedars, and they will be forced to make do with the team they have currently assembled. It is still a formidable squad, but, given the strength of the other teams in their preliminary group, Lebanon may not make it out of Group D. If coach Veselin Matic’s wards manage to punch a ticket to round two, though, they will have a very tough time going deeper in the tournament. Guys like Wael Arakji, Amir Saoud, and Ali Haidar may provide some glimpses of greatness, but inexperienced playmaking and holes in the frontline may eventually put them a notch below the elite. - Qatar had a three-step plan for their FIBA Asia Championship preparations. They went to Lithuania for their first training camp before heading to Manila for a series of tune-up games against PBA clubs. One main thing that basketball fans tried to keep tabs on was who would be this team’s naturalised player. They had former NBA player Jarvis Hayes in 2013 and employed veteran Boney Watson last year in the Asian Games. Many expected Watson to reprise his role this year, but the Qatar Basketball Federation (QBF) went with another old reliable instead - Trey Johnson. Johnson already donned the Qatari colors in 2012 for the FIBA Asia Cup in Tokyo, where Qatar won 3 of 7 games and finished in third place. He is expected to have an even bigger role this year, especially since Qatari icon Yaseen Musa has officially retired from international hoops. 28-year-old Khalid Suliman Abdi should be among Qatar’s leaders in the FIBA Asia Championship. In the 2013 edition in Manila, Abdi played mainly as a reserve, averaging 5.0 points and 2.8 rebounds, while, in the 2014 Asia Games, he took on a bigger role, shooting 60.0% from the field and 36.4% from beyond the arc en route to recording a team-high 15.0 points per match. With Trey Johnson playing mostly as a combo guard, Abdi should retain his spot as the team’s #1 wing threat. At 198cm/6ft 6in, he is bigger than most Asian guards and is quicker than most Asian forwards — that’s a combination that he should naturally exploit. Qatar has a great balance of size, mobility, and shooting. They are laden with veterans like Mohammed Yousef and Daoud Musa Daoud, but they also have a couple of young guys to watch out for, most notably Yehia Abdelhaleem and Saad Abdulrahman Mohamed, both of whom played in the 2014 FIBA Asia U18 tournament. This team would have been a shoo-in for the quarterfinals had it been in another group, but, as things stand, the Qataris are in for a royal rumble in the Group of Death. As long as Al Annabi doesn’t play below its potential, though, they they should be among the teams advancing to the second round and maybe even beyond. Prediction: Taiwan, Kazakhstan, and Lebanon advance, and Qatar is knocked out. 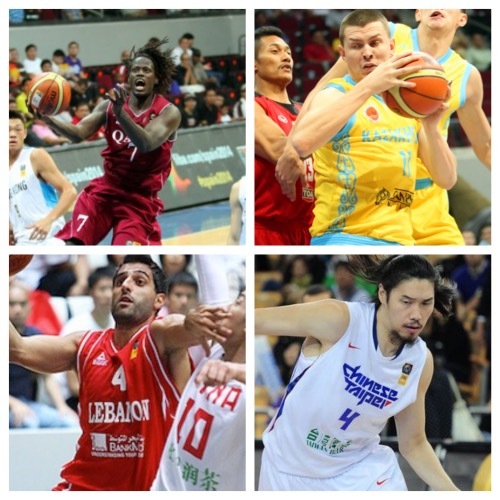 CHECK OUT OUR TOP-NOTCH COVERAGE OF THE 2015 FIBA ASIA CHAMPIONSHIP!